We did it! 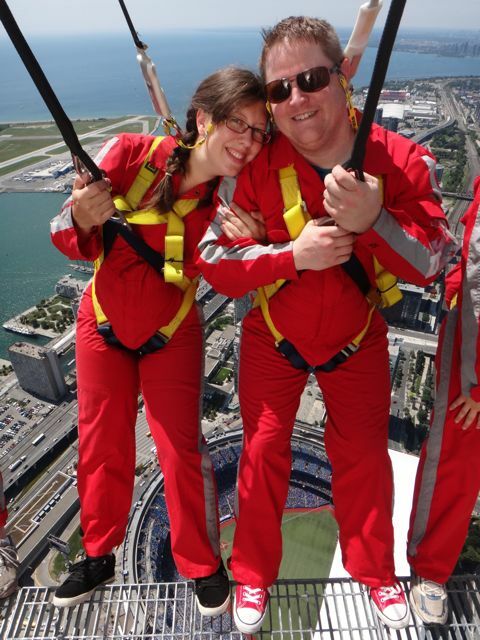 On August 10th, we did the thing we’ve been planning for over a year (since we couldn’t swing the money for our anniversary last year): the EdgeWalk at the CN Tower in Toronto. Yes, it’s pricey. It comes to almost $200 per person with tax. It’s also a pretty cool experience. I was lucky enough to enjoy it with my Hubbibi Sean (married nine years! ), my brother Ben, my two sisters, Em and Beth, Beth’s boyfriend Dylan – and Ben and Jasmine, the two other random people who chose the same walk time. 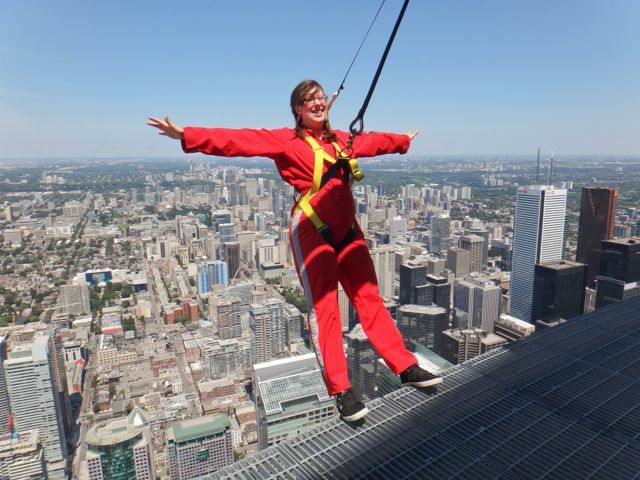 EdgeWalk suits = adorable, n’est-ce pas? It’s the highest full-circle hands-free walk in the world – a Guinness World Record – but apparently something similar did exist in New Zealand first. In French, they call it “Haut-Da Cieux”, which would roughly translate to “High Da Skies”, but it’s cool because if you say it aloud, it sounds like “audacieux.” Audacious. Yes indeed. It’s really quite safe. They’ve been doing many EdgeWalks a day since 2011 and haven’t lost anyone yet. You have to wear their custom-made suits, and wedgie harnesses, and then there are two different ropes to attach you to the structure (one stretchy). Your shoes must be closed – if you accidentally wore sandals, though, they lend you shoes. You can’t have ANYTHING droppable up there. No jewelry, no phone or camera, not even your watch. My sister had tape put over a piercing, and several of us had our glasses on lanyards attached to our suits. You CAN get married up there (I know you were wondering), with real pretty bride-and-groom walk suits, but you have to use their special elasticized rings, and you can’t have more than eight guests. Oh, and you pay $6K. You walk on a see-through metal grate the width of a sidewalk (1.5 m). You spend about half an hour on the walk itself. The rest of the hour-and-a-half includes suiting up, being checked over for safety many times, hearing the rules, and coming back to base camp for your DVD and solo photo (included in the price – but if you want all the photos you pay extra). For a full 8-person walk, you get two guides, who take you through several exercises when you’re up there, as well as offering some information about the giant buildings you’re looking way down on. 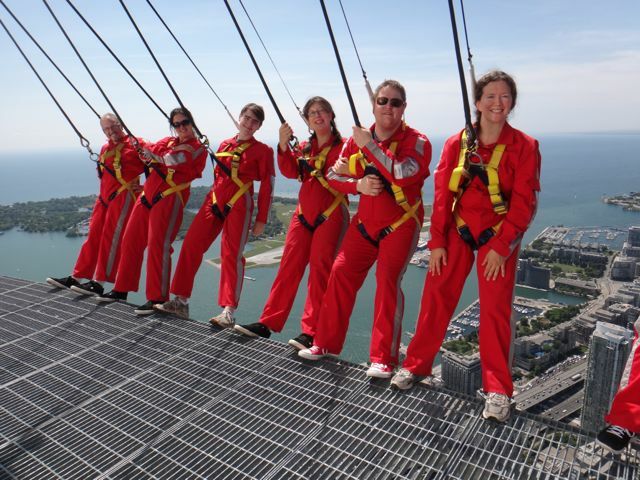 We did Toes Over Toronto (walk right to the edge and put your toes over it – and look down if you can), the backward lean (sit in your harness and shuffle back until you’re at the edge, then straighten your knees and lean back), and the Titanic Pose (walk almost to the edge, lean straight forward into the rope, and go up on your toes and let go). The backward lean. BMO and Royal Bank buildings visible on the right. We were lucky to get an absolutely gorgeous day: warm with a light breeze, clear enough to see across the lake. The SkyDome roof was open (yeah, I know it’s the Rogers Centre, but it will always be the SkyDome in our hearts), and the noise of the crowd whooshed right up to us whenever they cheered. See the SkyDome under our feet? Some of us loved it, and some of us endured it. Ben and Jasmine were cool as cucumbers (Ben was so cool he barely cracked a smile). Five of our party were loving the view and wishing we could spend more time out there. My poor Sean, though, was visibly anxious the whole time. In fact, he’d been anxious about it for at least a week before we even went. He was unable to get all the way to the edge for Toes Over Toronto, even though he was trying as hard as he could to breathe himself through it. He was able to do the Backward Lean, but did not choose to look up at the spike of the tower. It was interesting to show the DVD footage to our kids. It was a good opportunity to talk about what courage really is. E was asking, “Why isn’t Daddy doing it? Why is he nervous?” The big, strong, pragmatic, hardworking guy who never seems afraid – and whose idea this excursion was – has a terrible time with heights. On the day of the walk, once back inside the tower, Sean said he had to give us all props for doing the leaning and the looking and the letting go. He felt bad that he couldn’t make himself do the “daring” things the rest of us did. But really, he was the brave one. Just being out there is a big step for an acrophobe. For those of us who don’t mind heights, there wasn’t really courage involved. I mean, I walked out to the edge and felt a thrilling flip in my stomach, but I never felt like panicking. For me, heights are exhilarating. On the other hand, if I think of something that would make me panic, like being locked in a small space, you could not pay me enough to make me do that for half an hour. (Well, maybe you could – but it would have to be a LOT of money.) Fortunately for me, there is no industry glamourizing the thrill-seeking bad-assery of folks who want to confront their claustrophobia by braving small spaces. So, the essential message for my kids on Courage: it doesn’t kick in unless you’re afraid. What’s the worst fear you’ve confronted?